If your dream is to become a makeup artist, there are many exciting moments to look forward to – getting your makeup artistry certification, your first client, and setting up your makeup studio! A proper workspace is essential for makeup artists. It allows you to keep your makeup tools at your fingertips, see every detail, and bring your clients into a space you’re proud of! When it comes to setting up your makeup studio, there are some important things to keep in mind. You’ll need proper lighting, organized makeup products and tools, mirrors, and much more! 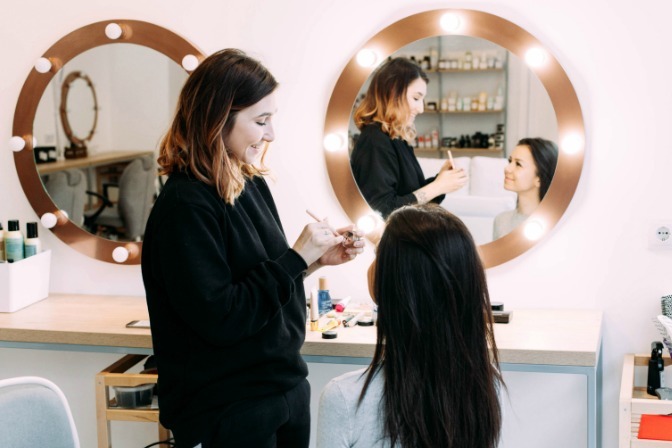 Read on for our top tips on how to set up a makeup studio that allows you to apply your best looks on every client! The type of makeup artist you are and the services you offer clients will determine which kind of makeup studio you should set up for yourself. If you work at a makeup counter, you create looks and provide advice out of a retail store. 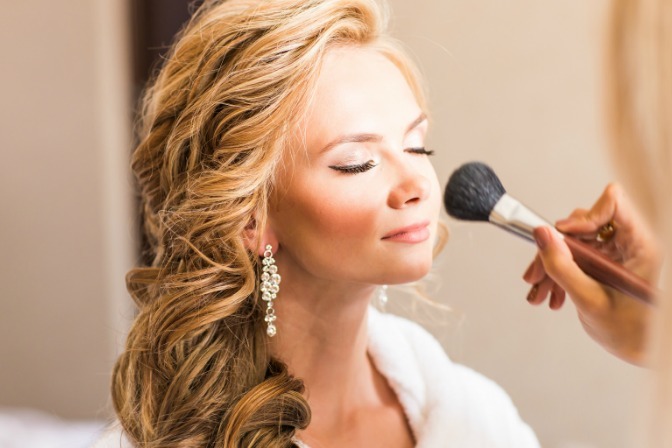 But you may offer smaller services such as bridal trials, makeovers, or even short makeup lessons, in which case a makeup studio is necessary! Or, if you are currently a full-time freelance makeup artist, it’s probably time to create a designated space for your makeup applications. So where do you set up your studio? If you have a nook or area in your house that would fit a chair, table, mirror, products, and is relatively close to a sink, this will make a great studio space! A spare room is even more ideal, since it’s not in a living room or bedroom. It’s a designated space specifically for your makeup career. Depending on your salary as a makeup artist, you can also rent out a commercial studio. An online search within your area will show studio spaces that are already set up for a makeup artist. Remember, the type of studio you choose is dependent on what kind of makeup artistry you offer. Do your research ahead of time to reflect on how your studio will add to your client’s experience! As you lay out your makeup studio plan, lighting should be the first order of business! All makeup artists know the importance of good lighting for flawless results, and that the best kind of light is natural light. Ideally, you would set up your makeup workspace near a window, as natural light helps you apply the makeup evenly. QC’s own makeup artistry graduate, Stephanie Wyatt, has carefully created a makeup workspace where natural light streams through a nearby window, allowing her to apply and blend makeup flawlessly. If you can’t put your makeup workspace near a window, you’ll need to find the best artificial light possible. We recommend a vanity mirror with (at least) ten bright bulbs to place on top of your makeup table. This illuminates your client’s face and allows you to see fine details so you can make corrections as you work. A second option for artificial light is halogen lightbulbs, specifically GE Reveal bulbs, which actually mimic bright sunshine and are the next best thing to natural light! In terms of where to place lights in your makeup studio, it’s best to avoid overhead lighting at all costs – it’s unflattering for the client and will prevent you, the makeup artist, from creating a flawless finish. Yikes! The right mirrors in your makeup studio go hand-in-hand with proper lighting. A vanity mirror with lights is the best choice. This type of mirror can hang on the wall or sit on a table, and will illuminate your client’s entire face. Your client will be able to watch the makeup process so you can also impress them with your advanced makeup artistry skills! However, a vanity mirror can be pricey and there are more affordable options available. If you do benefit from a window in your studio, having a self-lit, standing makeup mirror will add to your workspace. You can also have more than one, like a handheld mirror for your client once the makeup is complete – they’ll want to see your work up close, and can see the finer details! Having a designated work space as a makeup artist is such a wonderful feeling – all your supplies are kept in one place! 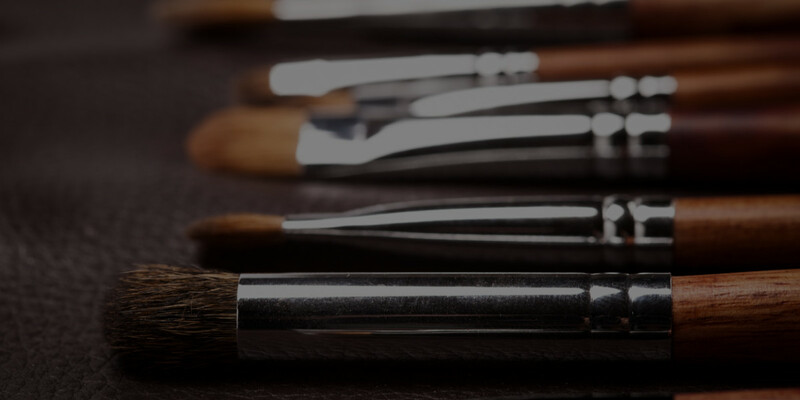 Whether your workspace is permanent in your home or a temporary rental, you’ll need to lay out your makeup tools and supplies to have them ready for each client. Makeup artists always have their kits at the ready, and they will grow over the years! Your supplies should be laid out on a table that is low enough so you could sit and do your own makeup, but also high enough to reach while you apply makeup on your client. You’ll want to keep everything as organized as a well-oiled machine, so you know exactly where each product, brush, and cleaning tool is located at the exact time that you need it. Lay out your products in the order that you’ll be using them, from primers down to mascara. This shows your clients that you are professional and organized. Bringing them into a clean and neat studio will provide them with a great first impression! Your makeup studio is a reflection of who you are as a makeup artist and the beautiful services you provide to clients. Setting up your own space is an opportunity to be creative and express yourself! While still being mindful of the proper lighting, mirrors, organization, and equipment, be sure to infuse the space with personal, fun elements as well! If you have a larger space to work with, paint the walls a color that is both pleasant and calming. Add decorative and meaningful pictures to the walls, too. If you are working with a small nook, allow the space to take on a personality of its own and distinguish it from the rest of your living area – curtains, a brightly colored rug, or a unique chair and table will make this space stand out. If you’re renting a studio space, you won’t have as much freedom to be creative, but you can still take some time ahead of each client’s appointment to organize the space to make it your own. A small house plant and oil diffuser will make a relaxing client experience! Your makeup studio is a representation of yourself as a makeup artist and your skills, so infuse it with your own unique personality! Whether your makeup studio is permanent or temporary, you’ll need a few key pieces of equipment to set it up! 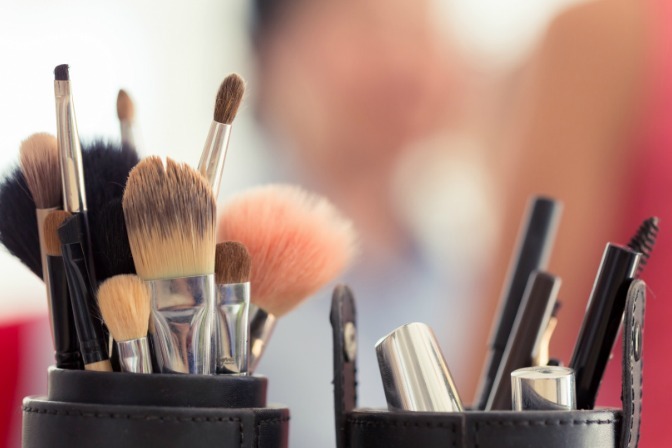 Check out our helpful guide on how to source makeup studio supplies!